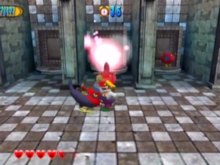 Ninja Crows are black crows with a red bandanna on their heads, encountered in the Wario World level Mirror Mansion. They are easy to defeat alone, but they almost always come in groups. After taking a few punches, Ninja Crows may produce a kunai from their mouth and jab Wario with it. Even when unprovoked, they can kick Wario with their sharp claws. Wario should stun them quickly and finish them off with a Piledriver, Wild Swing-Ding, or Mega Toss. The crows are invincible while performing their stabbing attack. Sasuke A reference to Sarutobi Sasuke. ↑ Stratton, Steve. Wario World Prima Official Strategy Guide. Page 15. This page was last edited on November 2, 2018, at 20:27.